Fran Jurga`s Hoof Blog: News from Hoofcare + Lameness: Laminitis Survey Results: Do horse owners value science-based advice? Do they use it? 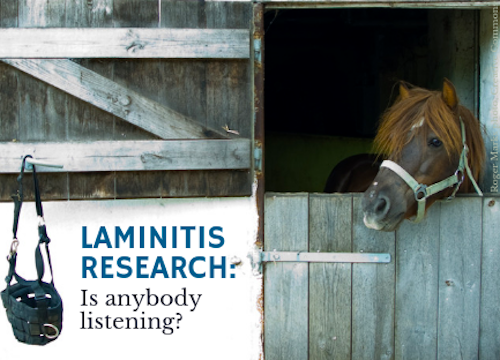 Laminitis Survey Results: Do horse owners value science-based advice? Do they use it? Equine research is fascinating, much-needed, and worthy of support. But are equine research findings being integrated into the care, feeding, and hoofcare of average horses? A survey in Great Britain set out to see if horse owners were applying research-based practices in their stable routines, using laminitis prevention as an example. What did the results show? Three quarters of responding horse owners, caregivers and stable managers believe that scientific research has a positive impact on horse welfare, yet most find the science difficult to understand and act upon, according to the survey results. The research was supported by the British horse feed company SPILLERS®, in collaboration with the Royal Veterinary College (RVC). 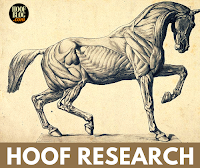 The Hoof Blog previewed this study in January 2018. The example of laminitis was used to explore levels of knowledge and implementation of methods to reduce the risk of this disease, by collecting results from 1,414 horse owners, caregivers and stable managers responsible for day-to-day horse management decisions. Over 75% of respondents who answered the question (n=1,205) reported that they practiced routine foot care, fed a balanced diet and maintained an ideal body weight. However, only 16% used a grazing muzzle and less than a third avoided turning out on a frosty morning, although 50% said that it was feasible to implement both of these measures. The majority of respondents were positive about the idea of scientific research: Over three quarters agreed with the statement “Scientific research has had an overall positive impact on horse welfare”. However, when asked what they thought of scientific research, many considered it to be difficult to understand, sometimes contradictory, and difficult to implement. “Findings from the provisional analysis have been generally positive, with most horse carers practicing fundamental measures, such as routine foot care and maintaining an ideal body weight. However, the overall feasibility and practice of some of the measures was generally quite low,” said Chantil Sinclair, a PhD student at the RVC who conducted the online survey. The final analysis will be used to design an interview-based investigation of barriers to or drivers for the adoption of evidence-based best practices. Then the study team will consider the most effective ways to facilitate the implementation of evidence-based science, in order to improve equine health and welfare. Sinclair's survey was supervised by Dr Jackie Cardwell and Dr Nicola Menzies-Gow of the RVC, Dr Carrie Roder of Anglia Ruskin University and Dr Pat Harris of WALTHAM Centre for Pet Nutrition. Some provisional results of the study were presented at the International Equitation Science Conference in Rome earlier this year and more recently at the 15th International Symposium of Veterinary Epidemiology and Economics. Click here to read more about the survey and the research. Click here to learn more about HoofSearch, the monthly report of equine hoof research.